Falcons senior defensive back Reggie Rembert was taken off the field in a stretcher in the first quarter of today’s season opener against visiting Northwestern State, the victim of an apparent neck injury. 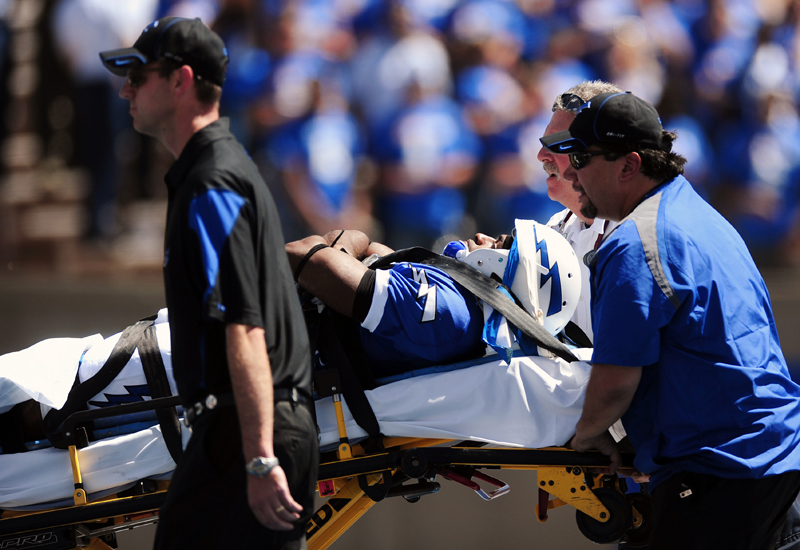 The Associated Press reports that Rembert gave fans and teammates a thumbs-up while being carried off the field. Air Force won the game, 65-21, after leading by just three points at halftime (24-21). UPDATE @ 3:10 p.m.: AP reports that Rembert had feeling in all of his extremities. UPDATE @ 3:40 p.m.: Northwestern State offensive lineman Josh Cunningham has now been was taken off the field on a stretcher with a neck injury, according to AP. Northwestern State said Cunningham had a possible stinger along with a concussion, and he was taken to the hospital as a precaution. He had movement on one side. UPDATE @ 4:40 p.m.: No word on Rembert’s condition. UPDATE @ 4:41 p.m.: Asher Clark scores on a 2-yard touchdown run and the Falcons connect on the PAT, giving Air Force a 38-21 lead with 10 minutes left in the third quarter. UPDATE @ 5 p.m.: Frank Schwab of The Gazette in Colorado Springs reports that Northwestern State’s Lance Lacoste is the third player taken off today with a neck injury. UPDATE @ 5:40 p.m.: After some first-half struggles, Air Force is pulling away, leading 59-21 with nine minutes left in the fourth quarter.